Contemporary Africa-China and Corruption-Challenge or Curse? After graduating from Harvard Law School in 1966, Jim joined the Peace Corps and was stationed in Malawi. Thus began a half century international career. He was legal advisor to Malawi’s Foreign Ministry, followed by stints with the World Bank, Citibank and international law firms both large and small. He has lived for extensive periods in the DC area, Nairobi, Moscow and now London and has worked directly in 25 African countries as well as in the Soviet Union/Russia and Eastern Europe. Jim has worked as both a lawyer and banker and served on the boards of a listed bank and a listed mining company. He is currently on the board of a renewable energy company. During this semi-annual trip to the States, he will join other 1966 Malawi volunteers in Florida. The Mid-Maine Global Forum and Holocaust and Human Rights Center of Maine are proud to host a luncheon program featuring Indira Williams Babic, the director of photography and virtual resources at the Newseum in Washington D.C. Ms. Williams Babic will discuss the creation of the exhibit 40 Chances: Finding Hope in a Hungry World. The event will be held on Friday, March 1st at noon, at the Michael Klahr Center, 46 University Drive, Augusta, Maine. Lunch will be available at 11:30 for $12, advance registration required. Indira Williams Babic is the director of photography and visual resources at the Newseum. In this role, she oversees the research, acquisition, digital processing, rights management and preservation of the Newseum’s collection of more than 500,000 historic images. Indira has managed and curated all images that have appeared in Newseum exhibits since the museum opened in its current location in 2008, including the original 14 galleries and more than 35 changing exhibits. Indira has more than 20 years of experience working in photography. Prior to joining the Newseum, she was a researcher for one of the first online stock photo services, a co-producer for a television variety show in Spain, and an editor for a book publisher in Panama. What does the Paris climate agreement mean for African countries? Doreen Stabinsky is professor of Global Environmental Politics at College of the Atlantic in Bar Harbor, Maine, USA. Her research focuses on political and policy responses to the impacts of climate change on agriculture and food security, with a particular interest in impacts on the African continent, and primarily within the context of the UN Framework Convention on Climate Change (UNFCCC) and the Paris Agreement. In 2015-2016, she held the first Zennström visiting professorship in Climate Change Leadership at Uppsala University, Sweden. She actively researches and writes about the impacts of climate change on agriculture and food security, and on the emerging issue of loss and damage from slow onset impacts of climate change. She also serves as advisor to a number of governments and international NGOs on issues related to agriculture and loss and damage in ongoing negotiations under the UN Framework Convention on Climate Change. Doreen has represented various NGOs and the College of the Atlantic in numerous intergovernmental forums, including the UN Convention on Biological Diversity, the UN Framework Convention on Climate Change, the UN Food and Agriculture Organization, the UN Commission on Sustainable Development, and the World Trade Organization. She has also held positions with and advised non-governmental organizations on topics related to genetic engineering and agriculture, including ten years as an agriculture campaigner with Greenpeace. Her most recent publications include: Environmental Politics for a Changing World: power, perspectives and practice (written with Ronnie Lipschutz) and Missing Pathways to 1.5 *C: the role of the land sector in ambitious climate action (published by the Climate, Land, Ambition and Rights Alliance, with several co-authors). Professor of Political Science/Director of International and Global Studies has a MA and a PhD from the University of Wisconsin; 1991 MA University of Wisconsin. Her areas of expertise are Political Science: Comparative Politics (Africa, Muslim World), Environmental Politics, Political Philosophy. Since joining the faculty in 2006, Linda Beck has developed several new courses that reflect her research interests, such as Civic Engagement & Social Accountability in which students work on a service-learning project with one of Maine’s many non-profit organizations. Linda has herself conducted research on social accountability in both Africa and Asia. She has also worked with Maine’s environmental community, serving as president of the Maine Conservation Alliance. Her work on environmental issues in the US and overseas informs her newly developed course, Environmental Politics in Comparative Perspective. Linda has published various articles, chapters in edited volumes and a book on ethno-politics and democratization in Senegal (W. Africa), and has conducted research for various development organizations such as the US Agency for International Development, the World Bank, Freedom House, and the International Budget Project. Laura is an assistant professor of Government at Colby College in Waterville, Maine. Her research is centered around the study of community responses to conflict and U.S. foreign policy in Africa’s Great Lakes region. She is currently finishing a book, Substituting for the State, about the role non-state actors play in governing the eastern DRC in response to the Congolese state’s weakness in North Kivu, South Kivu, and Ituri. She is also engaged in a new project on the effects of U.S. legislation designed to mitigate conflict in central Africa and in 2014, She is leading an impact evaluation of a large community-based reconstruction (CBD) governance intervention in four Congolese provinces. Her research and teaching interests include qualitative and mixed methods, African politics and development, and post-conflict state reconstruction. She has also worked with the World Bank in Nigeria on efforts to improve the national primary health care system through evaluating the implementation of a results-based finance system, with particular attention to reducing instances of maternal, infant, and child mortality by removing demand-side barriers to system access. At Colby, Laura teaches African politics, conflict, and research methods. She blogs about African politics, development, and security at Texas in Africa and am a contributor to the Duck of Minerva, the Christian Science Monitor’s Africa Monitor blog, and The Atlantic.com. Does Trump + Putin = The End of The West? Seth Singleton teaches international relations at the University of Maine. He studied Russian history at Harvard and received his Ph.D in International Relations at Yale. He won the American Political Science Association prize for best dissertation in International Relations while at Yale University and has held grants from the Rockefeller Foundation, the National Council on Soviet and East European Research, the Fulbright program, and the Open Society Institute. He has lived and worked at universities in Russia, Tanzania, Ecuador, and Vietnam, and consulted in China, Mongolia, and Bolivia. Along with teaching, he has been faculty research associate at Harvard and academic dean in universities in the US and overseas, most recently Associate Provost in charge of curriculum and faculty at the new Tan Tao University in Vietnam. Seth and Charlotte Singleton live in Mount Desert. Mr. Stancioff is a geologist, natural resource planner, analyst, and manager with 35 years of experience in geology, hydrology, agriculture, fisheries, forestry, climatology, and oceanography. He has 40 years of experience in developing countries and 24 years in Africa. During the last ten years, Mr. Stancioff has worked to develop methods and models to monitor and evaluate poverty and conflict in areas under stress from overpopulation and overuse of natural resources and other forms of degradation. He has been involved in modeling, demographic health and environmental data in support of early warning systems. For six years, he mapped the geologic, mineral, hydraulic and natural resources of Zaire, Guinea, Central Africa, and Mauritania. From 1991‑96, he was the USAID “team leader” at the AGRHYMET Center in Niamey, Niger where he developed maps for agricultural and health development projects for 13 African countries. In recent years, Mr. Stancioff has focused climate change and its effects on water resources and on reducing atmospheric Carbon Dioxide by reforesting areas in north Africa. He is presently seeking support for an effort to reforest some of the most appropriate areas in the Sahel of Africa to sequester Carbon and to provide improved living conditions to people in that region. Chris Myers Asch serves as CANMP’s Executive Director. A native of Washington, D.C., Chris teaches history part-time at Colby College and is the author most recently of Chocolate City: A History of Race and Democracy in the Nation’s Capital. He and his wife live in Hallowell and have three children. Please register by Monday, June 4th, 12 noon. The lunch is as usual $12 and you are free to bring your own food! As part of our Oak-Grove grant to provide programs in schools and for the broader community, the Forum is please to host this documentary film. Pious Ali, a Youth and Community Engagement Specialist at the University of Southern Maine’s Muskie School of Public Service, has spent the better part of his life focused on community engagement. Pious is the first African-born Muslim American to be elected to public office in Maine, becoming a member of the city’s elected Board of Public Education in 2013 and an at Large- City Councilor in November 2016. He also founded the Maine Interfaith Youth Alliance and is the co-founder of King Fellows, a Portland-based youth group dedicated to creating meaningful opportunities for youth through leadership and civic engagement based on the legacy of Dr. Martin Luther King, Jr.
Pious is an alumnus of the Institute for Civic Leadership (now known as Lift360), and in 2015 he was named Lift360’s Most Distinguished Alumnus. A native of Ghana, Pious migrated to the United States (NY) in 2000 and has called Portland his home for the past decade where he lives with his children ( daughter and son). He is also a gifted photographer and has worked as a photojournalist for a range of print publications in Ghana. Mexican artist Yoshua Okón’s videos blur the lines between documentary, reality, and fiction. He collaborates closely with his actors (often amateurs) to create sociological examinations that ask viewers to contemplate uncomfortable situations and circumstances. In this talk, he will focus on a select group of works produced over the last twenty years including Oracle, now on view at Colby, and Octopus, a piece made in Los Angeles in 2011. Public reception to follow in the Museum’s William D. Adams Lobby. Yoshua Okón was born in Mexico City in 1970. In 2002 he received an MFA from UCLA with a Fulbright scholarship. His solo exhibitions include: Yoshua Okón: Collateral, MUAC, Mexico City; Yoshua Okón: In the Land of Ownership, Tokyo; Saló Island, UC Irvine, Irvine; Piovra, Kaufmann Repetto, Milan; Poulpe, Mor Charpentier, Paris; Octopus, Cornerhouse, Manchester and Hammer Museum, Los Angeles and SUBTITLE, Städtische Kunsthalle, Munich. His work is included in the collections of Tate Modern, Hammer Museum, LACMA, Colección Jumex and MUAC, among others. Friday, April 13, 2018, 3:00 p.m. to 5 p.m. In this presentation we will discuss the history and the successes or failures of some of America’s foreign interventions. Since the end of WWII the United States has intervened in more than 70 countries, sometimes overtly militarily (Korea, Vietnam, Dominican Republic, Panama, Iraq, Afghanistan), clandestinely (USSR, Chile) or with the use of proxies (Afghanistan in the 1980s, Syria today). Many of these interventions have had the stated aim of deterring the spread of Communism but in so doing they propped up brutal authoritarian regimes (Nicaragua, Guatemala), and in at least one case led to the assassination of a democratically elected leader (Chile). Today many are accusing Russia of intervening in the 2016 presidential election. When, and how, is foreign intervention wise, necessary — or reckless? Nick B. Mills is a global strategic communication consultant with many years of experience as a teacher, trainer, adviser, spoken-word presentation coach, public relations counsel, broadcaster, and professional storyteller. Mr. Mills taught broadcast and print journalism for 26 years at Boston University, managed educational programs for Boston University in London, Oxford University, and Washington, D.C.; and managed programs at B.U. for visiting Portuguese journalists. He made thousands of news broadcasts on major Boston radio stations and nationwide on the ABC Radio Network; and coached high-ranking government, military and corporate leaders in the effective use of spoken-word communication in a variety of media. Clients have included the president of Panama, the Defense Minister of Colombia, the Prime Minister of Malaysia, the commander of the Indonesian armed forces, and many others. Mr. Mills served with the 3rd Infantry Division in Baghdad, Iraq in 2007 as an adviser in the Division Public Affairs Office; in 1992, after the first Gulf War, he recruited and trained Iraqi Kurds in visual journalism, in northern Iraq. In 2004 Mr. Mills served as a trainer and adviser in the press office of President Hamid Karzai in Kabul, Afghanistan; his experiences in the presidential palace in Kabul led to his collaboration with President Karzai to produce a book, KARZAI – The Failing American Intervention and the Struggle for Afghanistan. Years before that in Peshawar, Pakistan he trained a hand-picked group of Afghans in journalism and established the first full-service Afghan news agency, AMRC, now based in Kabul, Afghanistan. Mr. Mills’s experience as an Army combat photographer in Vietnam led to the publication of two books, Combat Photographer (Boston Publishing/Time-Life) and The American Experience in Vietnam – Reflections on an Era (Boston Publishing/Zenith). He has also written for Huffington Post, MaineToday.com, Foreign Policy, Yankee Magazine, and Gray’s Sporting Journal. He has written and produced award-winning radio commercials, and has been a featured storyteller at the Maine Lobster Festival. Mr. Mills is a past president of the Board of Directors of the Maine Center for Public Interest Reporting, a member of the board of the Holocaust and Human Rights Center of Maine, and president of the Upper Dam Camp Owners Association. Dr. Richter’s current research pursues two different but related tracks. First, following upon earlier scholarship on the role of non-governmental organizations (NGOs) in Russian governance under Putin, he is working on a long-term project that compares and contrasts the relation between state and society in Russia and China. He is particularly interested in tracing continuing patterns of governance back through the imperial period of the 19th century. Last June Dr. Hopper visited universities in the Palestinian Territories to help them develop the process for accreditation and quality assurance. He will talk about his trip and what is happening with higher education in the challenging environment of the occupation. Dr. Vekasi will present the annual Leeke-Shaw Lecture on International Affairs at the Margaret Chase Smith Library in Skowhegan on Thursday, November 2nd. Japan’s postwar constitution prohibits the country’s use of force as a way of settling international disputes. For decades, Japan’s pacifist stance has had broad support from the Japanese public, limiting the options for hawkish politicians like current Prime Minister Abe Shinzo. Recent conflicts in East Asia including Chinese actions in the East and South China Sea and nuclear tensions on the Korean Peninsula, however, have pushed Japan closer to becoming a “normal” military power than any other time post 1945. This talk will cover the ramifications of possible Japanese remilitarization for Japan, the United States, and global stability. Dr. Vekasi is a professor of Political Science at the University of Maine. She received her PhD at the University of Wisconsin, Madison, and has conducted extensive research and fieldwork across Northeast Asia, particularly in China and Japan. She has been a visiting fellow with the Japan Foundation at Tokyo University, a Foreign Language and Area Studies fellow at the Harbin Institute of Technology, and a Fulbright Fellow at Tohoku University. She is a member of the US-Japan Network for the Future through the Mike and Maureen Mansfield Foundation and Japan Foundation’s Center for Global Partnership. Her research focuses on China-Japan relations, and how multinational firms manage political risk in a globalized and politicized world. Her most recent publications in the Chinese Journal of International Politics and East Asia Forum Quarterly discuss how private firms use cultural exchange programs to improve tense international relations. Jinyan Zeng, a Chinese filmmaker, blogger, activist, and scholar, has been named the 2017 Oak Human Rights Fellow at Colby. This is the first time in its nearly 20-year history that the Oak Institute for Human Rights has selected someone from the People’s Republic of China. How do government, private sector, and individuals use video for their own ends in China? This talk will explore practices of video confession, surveillance, and sousveillance (inverse surveillance) in China. Zeng has spent more than a decade and a half fighting for people with HIV-AIDS, women facing discrimination, factory workers suffering exploitation, a natural environment threatened by pollution, and political dissidents experiencing repression. This work sometimes upsets the Chinese party-state, which at different times has detained and surveilled her. In 2006 Zeng made her first documentary, Prisoners in Freedom City, about living under house arrest in Beijing. Her most recent film, We the Workers, had its world premier at the Rotterdam International Film Festival in January 2017. During the production of that film, the Chinese party-state detained several of the featured labor activists, placed a few of them under house arrest, and forced still others to make “confessions” on state television. Zeng is cofounder of the Chinese Independent Documentary Lab in Hong Kong and the leading curator of an independent Chinese film series. In 2017 Zeng earned a Ph.D. from the University of Hong Kong, where she studied film, gender, and cyber-activism. 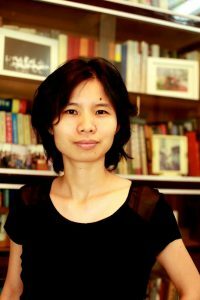 Her dissertation focused on the work of Ai Xiaoming, a feminist professor of literature and a documentary filmmaker in China. During the fall, when Zeng will be in Maine, she looks forward to editing footage for a new documentary on the pro-democracy “Umbrella Movement” in Hong Kong. And she is eager to talk with Colby faculty, staff, and students who are curious about China, film, and human rights. Zeng arrives in Waterville in August. This program is sponsored by the Maine Humanities Council as part of its “World in Your Library programs. We are grateful to the Council for its support and collaboration. One new social phenomenon in China’s post-Mao reform era is the resurgence and wide-spread popularity of political satire. Diverse and pungent satirical sayings of reform-era China poke fun at corruption, hypocrisy, bureaucratic inefficiency, as well as voice outcries at new social ills and injustices. This talk explores the popularity and role of political satire as a form of protest to vent dissent in the authoritarian China, and argues that as a social barometer, the political satire provides us an important window to understand how Chinese people develop their political astuteness through producing, circulating, and consuming political humor and satire in contemporary China. The Mid-Maine Global forum is pleased to host Ambassador Derek Mitchell as our guest speaker at our annual summer dinner program. Ambassador Mitchell is senior advisor to the Asia Program at the U.S. Institute of Peace. His most recent position in his distinguished career was as Ambassador to Myanmar (2012-2016). He was director of the Southeast Asia Initiative at the Center for Strategic and International Studies (CSIS) in Washington, D.C., and worked for the Department of Defense specializing in Asian security policies. Ambassador Mitchell has authored numerous books, and articles on Asian security affairs, and co-authored China: The Balance Sheet – What the World Needs to Know about the Emerging Superpower (Public Affairs, 2006). Ambassador Mitchell will bring his expertise and experience to us with his discussion of the value of American foreign policy in Asia and the world. Adotei Akwei is Managing Director for Government Relations for Amnesty International USA. Before rejoining AIUS he was Deputy Director for Government Relations for CARE USA. As CARE USA Deputy he worked on Climate Change, Emergencies, Countries in Conflict and Micro-Finance in Sub-Saharan Africa. Prior to joining CARE he worked for 11 years for Amnesty in a number of positions including Africa Director for the Lawyers Committee for Human Rights and Human Rights Director for the American Committee on Africa and the Africa Fund. He received a Masters in International relations from the College of William and Mary. He is originally from Ghana. This film has been shown all over the world, including in the British Parliament, the US Congress, The Hague, the Italian Senate and at many film festivals. The film has some graphic scenes and may not be appropriate for younger students. Thanks to a generous grant from the Oak-Grove Foundation the Forum is able to bring this distinguished speaker and film to our community and provide a program for high school students and faculty. The story of immigrants in Maine is older than the state itself. From Verrazano’s first glimpse of Maine in 1524 on, immigrants have played a key role in shaping Maine and her people. This program, inspired by our 2015 exhibit of the same name, provides an overview of Maine’s immigrant past, and serves as a reminder of the important role that immigrants will play in our future. Join the Mid-Maine Global Forum and the HHRC for This is ME, Too: From Everywhere to New Mainer. This event will include a panel discussion with three New Mainers: Somali refugee Abdi Iftin; Iraqi refugee Nawar Al Obaidi; and Cambodian refugee Makara Meng. In this panel discussion, Abdi, Nawar and Makara will speak about their experiences coming to Maine, misconceptions and stories we don’t hear in the news about their home countries, and answer questions. Steve Ball, a retired U.S. Army Colonel and MMGF Board Member, will give a talk on current efforts to address the ongoing problems associated with un-exploded munitions left from wars in Vietnam. Steve spent last year as the Vietnam Country Director for Golden West Humanitarian Foundation, a Nongovernmental Organization working globally to safely and effectively remove explosive remnants of war. Steve will talk about the extent of the un-exploded munitions problem in Vietnam and neighboring Cambodia and Laos and what actions are being taken by Vietnam and partnering countries to alleviate the associated damaging social and economic problems. Steve retired from the Army in 2005 after over 27 years of active service. His last tour of duty was as the U.S. Defense Attaché to Vietnam. After his tour he has returned to Vietnam on two occasions working for humanitarian organizations operating largely in the central provinces of Vietnam. Note the earlier starting time, so get there 15 minutes early if you are having lunch. The images most Americans have of Saudi Arabia are frighteningly predictable – deserts, camels, and oil; Sharia law, Islamic fundamentalism, and jihad; rich sheikhs in white robes, oppressed women in black veils, and terrorists. In this talk I challenge these destructive Orientalist stereotypes by introducing the relatively unknown world of contemporary Saudi art. The work of young Saudi artists presents a unique insiders perspective on Saudi society and culture that offers more nuanced and complex portraits of Saudi Arabia than those that circulate in the American media. An open air mosque made out of chain link fencing. Yoda sitting next to King Faisal as Saudi Arabia joins the United Nations. And a Saudi woman painting a junked car pink. Loring M. Danforth is chair of the Anthropology Department at Bates College, where he has taught since 1978. He is the author of five books and has written extensively on Greece. His latest work, Crossing the Kingdom: Portraits of Saudi Arabia (University of California Press) is based upon a trip to the country he took with sixteen students in 2012. Khalid Albaih is a political cartoonist from Sudan. He is Colby’s 2016 Oak Fellow at the Oak Institute for the Study of International Human Rights. Albaih uses his daring, often biting cartoons to champion freedom of expression and democracy in the Arab world, while criticizing Western Islamophobia and U.S. practices including torture and drone attacks. Albaih draws simple but evocative images that are primarily displayed online. Many of those images have gone viral, earning him international recognition. Huffington Post mentions him first in its list of the world’s leading Arab cartoonists. During the Arab Spring uprising in 2011, Albaih’s images were turned into stencils and reproduced on city walls in Cairo and Sana’a. He acquired thousands of followers on his Facebook site (“Khartoon!”—a play on his artistic medium and his former home in the capital of Sudan). His work also has appeared in exhibitions in Vienna, London, Montreal, Detroit, Bahrain, and The Hague and has been featured in media outlets including the New York Times and Al-Jazeera. The son of a diplomat and a social justice activist, Albaih was born in Romania and grew up in Sudan and Qatar, where he now lives. He received a B.A. in interior design engineering from the Ajman University of Science and Technology and worked as a graphic designer and multimedia specialist before becoming head of installations and design for public art in Qatar Museums Authority. How do people whose entire way of life has been destroyed and who witnessed horrible abuses against loved ones construct a new future? How do people who have survived the ravages of war and displacement rebuild their lives in a new country when their world has totally changed? In Making Refuge Catherine Besteman follows the trajectory of Somali Bantus from their homes in Somalia before the onset in 1991 of Somalia’s civil war, to their displacement to Kenyan refugee camps, to their relocation in cities across the United States, to their settlement in the struggling former mill town of Lewiston, Maine. Tracking their experiences as “secondary migrants” who grapple with the struggles of xenophobia, neoliberalism, and grief, Besteman asks what humanitarianism feels like to those who are its objects and what happens when refugees move in next door. As Lewiston’s refugees and locals negotiate coresidence and find that assimilation goes both ways, their story demonstrates the efforts of diverse people to find ways to live together and create community. Besteman’s account illuminates the contemporary debates about economic and moral responsibility, security, and community that immigration provokes. Catherine Besteman is an anthropologist who has taught at Colby since 1994. After conducting ethnographic fieldwork in Somalia in the late 1980s, she reunited with her former neighbors from Somalia when they began moving to Maine as resettled refugees in 2006. Her new book, Making Refuge: Somali Bantu Refugees and Lewiston, Maine, chronicles their journey from war-torn Somalia, to Kenya’s massive refugee camps, and, finally, to Lewiston. Besteman is a recent Guggenheim fellow, and her research for this book was also supported by grants from the Rockefeller Foundation and the American Council of Learned Societies. The Mid-Maine Global forum is pleased to present Nicholas Burns as our special guest speaker at our annual summer dinner program. Dr. Burns brings his 27 years of experience in the U.S. foreign service, and his expertise as Professor of the Practice of Diplomacy and International Relations at the Harvard Kennedy School of Government, to the Mid-Maine Global Forum for an insightful presentation regarding the significance of foreign policy for the next President of the United States. Not only is Professor Burns a member of Secretary of State John Kerry’s Foreign Affairs Policy Board, but he is Director of the Aspen Strategy Group, and Senior Counselor at the Cohen Group. Nicholas Burns writes articles and opinion pieces for numerous publications including the Boston Globe, the Washington Post, Harvard International Review, and the New York Times. The Aspen Strategy Group released its latest policy book, Blind Spot: America’s Response to Radicalism in the Middle East, edited by Nicholas Burns and Jonathon Price, December 2015. Bigelow Laboratory spoke on the situation of the Bay of Fundy and the world’s oceans. TWO PROGRAMS ON THE SAME DAY! Rozell “Prexy” Nesbitt was born and raised on Chicago’s West Side. After graduating from the Francis Parker School in Chicago, Nesbitt enrolled at Antioch College in Yellow Springs, Ohio. After graduating from Antioch in 1967, Nesbitt continued his education, attending the University of Dar Es Salaam in Tanzania; Northwestern University; and Columbia University. Even before completing his Ph.D. in 1975, Nesbitt was highly active in labor and equality movements; by 1976, he had become the national coordinator and field organizer for the Bank Withdrawal Campaign for the American Committee on Africa. Two years later Nesbitt was named the director of the Africa Project at the Institute of Policy Studies in Washington, D.C. In 1979, Nesbitt became the program director and secretary for research at the World Council of Churches, based in Geneva, Switzerland. Nesbitt returned to Chicago in 1984, where he continued his work as a labor organizer. In 1986, Chicago mayor Harold Washington named Nesbitt as a special assistant. The following year, the government of Mozambique appointed Nesbitt to serve as a consultant to help them represent their interests to the United States, Canada, and Europe; he remained in this post until 1992. In 1990, Nesbitt took a post as a lecturer with the Associated Colleges of the Midwest, and in 1993, became the senior program officer with the Program on Peace & International Cooperation with the MacArthur Foundation. Nesbitt remained with the MacArthur Foundation until 1996, when he was named the dean of community engagement and diversity. In addition to his foundation work, Nesbitt worked as an African and American history teacher at his high school alma mater, Francis W. Parker School. Nesbitt also taught African History at Columbia College, and served as a consultant on diversity for the Francis W. Parker School; the University of Chicago Laboratory Schools; and the East Educational Collaborative in Washington, DC. In 2001, Nesbitt became the South African representative of the American Center for International Labor Solidarity in Johannesburg, South Africa, and the interim director for the American Friends Service Committee Africa Program. From 2003 on, Nesbitt worked as the Senior Multiculturalism and Diversity Specialist for the Chicago Teachers Center at Northeastern Illinois University. Nesbitt has lectured both in the United States and abroad, and has written extensively, publishing a book and articles in more than twenty international journals. Nesbitt also served as a co-writer on the BBC production of The People’s Century programSkin Deep, about racism in the United States and South Africa. Over the course of his career, Nesbitt made more than seventy trips to Africa, including trips taken in secret to apartheid torn South Africa; his work has garnered him numerous awards throughout his career. Knight will be about the global LGBT human rights movement and how the uptick in support from some governments has been met with backlash elsewhere–and what those of us who care about human rights can do about it in such turbulent political times. Gay rights work has very little to do with the wealth of a nation and far more to do with courage and creativity at a local level. Immigration to Maine has been part of the American narrative for the past few centuries. America, as a nation of immigrants, has historically, with a few exceptions, welcomed the world’s persecuted by offering them safety and a chance to start a new life. Maine’s recent immigrants, most of them refugees fleeing wars, religious and political persecution, arrive from war-torn countries such as Somalia, Sudan, Bosnia, Afghanistan, Iraq, and Rwanda, to name a few. The Book, New Mainers, Portraits of Our Immigrant Neighbors tells the stories of 29 New Mainers. Reza Jalali will discuss the book and the need to tell the stories of today’s immigrants. Reza Jalali is a writer, educator, and a community activist, who has taught at the Bangor Theological Seminary and the University of Southern Maine (USM) as an adjunct faculty. Jalali has written the Foreword to New Mainers (©2009, Tilbury House, Publishers) a book on immigrant’s lives in Maine. His children’s book, Moon Watchers has received a Skipping Stones Honor Award for Multicultural Book. Jalali’s short story collection, Homesick Mosque and Other Stories was published in 2013. His play, The Poets and the Assassin, which is about women in Iran and Islam, was published in 2015. He has been a storyteller in the National Public Radio’s nationally-acclaimed The Moth Radio Hour. He coordinates the Office of Multicultural Student Affairs at USM and advises Muslim students at Bowdoin College. Marta Ameri received her Ph.D. in Art History and Archeology from the Institute of Fine Arts at New York University in 2010. She is currently working as an Assistant Professor of Art History at Colby College where she teaches courses focusing on Ancient, Medieval and Islamic Art. Her research focuses of the role the seals play as markers of identity and as indicators of intercultural exchange in the Ancient Near East and South Asia. Her dissertation catalogued and examined a group of seals and seal impressions found at the Chalcolithic site of Gilund in Western India. Her current research focuses on the visual analysis of seals of the Indus Valley Civilization. She is also co-editing a major volume which examines the production, use and iconography of seals in the Ancient World, from the Aegean to South Asia. She has excavated in Italy, Greece, Turkey, Syria, India and Oman. In the ancient world, stamp and cylinder seals were one of the primary tools of administration and played a significant role as markers of social and individual identity. They could be use to identify the carrier, sign documents, seal containers, and lock doors. Like cell phones today, a person could feel lost or naked without his or her seal. At the same time, however, most seals were also extraordinary examples of art in miniature, carved with everything from the seal owner’s name and position to entire mythological scenes featuring numerous gods and goddesses. This lecture will focus on the ancient Mesopotamian seals, tablets and sealings on loan to the Colby College Art Museum for the Spring 2016 semester. By examining both the artistic and functional aspects of these objects, it is possible to develop a deeper understanding of the practical and ideological concerns of the people of Ancient Mesopotamian, and how these may still be relevant in the modern world. William Farrell serves as Vice President for Corporate and Foundation Relations at Mercy Corps, a leading relief and development organization with ongoing operations in 43 countries, nearly 4,500 staff, and an annual operating budget of over $300 million. He helps develop partnerships to increase the reach and results of Mercy Corps’ work. Prior to this position, Farrell was Mercy Corps’ Vice President for Program Development, managing the design and support of high impact programming globally. A graduate of Tufts University and of the Fletcher School of Law and Diplomacy, Farrell has worked with international donor agencies, non-governmental organizations, and the United States Government over the past two decades. His experience in transitional countries has given him significant background in confronting the challenges of instability through community-led and market-driven programming. Seconded by the United States Department of State to the Organization for Security and Cooperation in Europe, Farrell was substantially involved in the formal peace negotiations between Georgians and South Ossetians as well as between Tajiks, during the civil war in Tajikistan. His work with the United States Agency for International Development in Central Asia helped communities and governments develop stronger partnerships to enhance the lives and well-being of citizens. He has worked in support of emergency response in Sudan, as well as assessing large parts of the Sahel for concrete ways in which development assistance can be used to counter extremist activity. Farrell is proficient in Russian and German. He lives with his wife and five children in Maine. He is Adjunct Faculty at the University of Maine Business School. In the more than fifty years since the beginning of the space age in 1957, much has been accomplished, our knowledge advanced, and a future made more positive. This presentation offers a survey of spaceflight history and offers comments on what might be expected in the next fifty years. Roger D. Launius is Associate Director for Collections and Curatorial Affairs at the Smithsonian Institution’s National Air and Space Museum. He has written or edited more than twenty books on aerospace history. Between 1990 and 2002 he served as chief historian of the National Aeronautics and Space Administration. A graduate of Graceland College, he received his Ph.D. from Louisiana State University in 1982. He is a Fellow of the American Association for the Advancement of Science, the International Academy of Astronautics, and the American Astronautical Society. He also served as a consultant to the ColumbiaAccident Investigation Board in 2003 and presented the prestigious Harmon Memorial Lecture on the history of national security space policy at the United States Air Force Academy in 2006. He is frequently consulted by the electronic and print media for his views on space issues, and has been a guest commentator on National Public Radio and all the major television network news programs. Koberinski is launching the Beyond Pesticides Network to transform Canada’s food systems. Professionally, this represents a bold move. Not so long ago Koberinski was an entrepreneur operating a café and a small-scale food processing project. Then she spent six years as the executive director of the Organic Council of Ontario, working to create change from within the corporate-industrial food complex. Now she is a frontline activist who supports farm families, rural communities, and those living in poverty in their fight for food sovereignty. Although Koberinski hails from a country that has earned a global reputation as a champion of human rights, she says she feels increasingly vulnerable in Canada. For one thing, this outspoken critic of industrial food production says powerful agribusiness interests that benefit from the status quo are ever more vigilant in their efforts to discredit her. For another, she believes Ottawa has grown hostile to activists like herself. In recent years Voices-Voix, a network of Canadian civil society organizations, has documented what it calls “the shrinking democratic space for dialogue on public policy and for dissent” in Canada. In a 2013 report it claimed that environmental groups, in particular, are being “systematically silenced” by the government. A researcher at Queen’s University in Ontario believes that Canada is gripped by a “green scare,” and that federal agencies routinely spy on such organizations—a claim denied by law enforcement. Koberinski, who calls herself a “town crier,” comes to Colby College as the political environment grows increasingly fractious back home. She will arrive in late August and spend the fall semester here, leading a human rights seminar on food systems, consulting with members of the campus and Maine communities, and building the Beyond Pesticides Network. At the moment, Koberinski is working without pay, relying on crowdsourcing to finance her grassroots campaign. She is known as an unflagging source of innovation, an activist who tirelessly helps others and furthers the cause of food sovereignty. She is a global leader on this issue and is recognized for her vital work transforming—not just reforming—agriculture to provide sustainable, safe, and secure food systems around the world. Denise Vaillancourt will discuss the topic of evaluation as a learning tool for improving the effectiveness of global health investments. She will focus on two of her recent evaluations – one on malaria control in Benin and the other on health care modernization in Albania. Ms. Vaillancourt is a native of Mexico, Maine, who has gone on to a long and successful career as an expert in the field of international health. She holds a master’s degree in International Public Policy from the Paul H. Nitze School of Advanced International Studies at The Johns Hopkins University, where she also has studied health policy and management. In addition, she is an instructor in the Department of International Health at Georgetown University. In 1976, Denise moved from the staff of Senator Edmund Muskie to a position with The World Bank. She has served as a member of the Bank’s Independent Evaluation Group since 2003 and in that capacity, has evaluated health projects and programs in countries around the globe. Her name may be familiar to many people as Monica Wood’s BFF in the author’s poignant memoir about growing up in a Maine mill town during the early 1960s, When We Were the Kennedys. Russia annexed Crimea and began a proxy war in eastern Ukraine a few months later. Under President Vladimir Putin, Russia has cracked down on democratic institutions, rapidly increased military spending, and engaged in an old-style propaganda war with the west. While the Russian economy is cratering, Putin’s popularity remains high among citizens. In this talk, Paul Josephson will analyze Putin’s policies and programs, especially as they have an impact on relations with the United States. Paul Josephson, a specialist on the former Soviet Union, teaches history and history of science and technology at Colby College. Fluent in Russian, he travels to Russia and Ukraine several times a year for research and lectures.